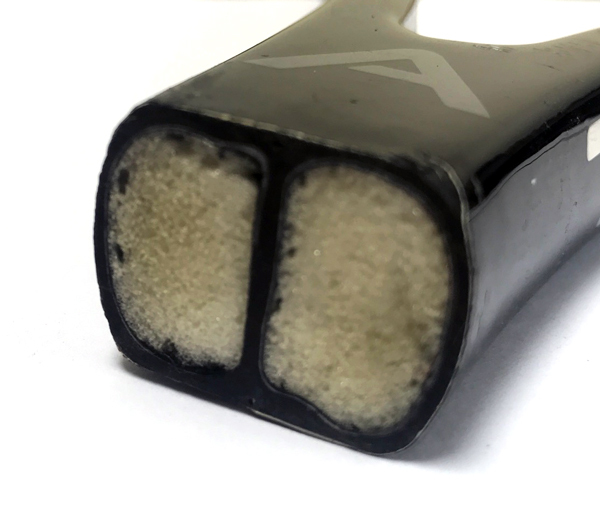 Developed to control resin flow during the moulding process, the Angell Micro braided layer of carbon acts as a barrier, to resist the flow of molten resin and stabilise the composite structures static weight. This new development significantly improves the consistency of our frames at the manufacturing level and ensures our high level of repeatability to players is even further enhanced. Designed to reduce frame vibration and improve the impact sound, every Custom and Tour model has been filled with a medium density expanding PU foam. Once an industry standard, Angell continues to provide this additional manufacturing process on the majority of its frames as part of its commitment to product excellence. Well known as a material of choice for stopping bullets, Aramid fibres provide excellent dampening properties when used in the construction of rackets. Mixed with high modulus carbon fibre, the unique matrix within our K series frames produces a very unique feel on every shot.